If you’re one of the 25 million single women over the age of 45 living in the United States today, AARP’s The Single Woman’s Guide to Retirement is your new best friend. Walking you through the challenges of retired or pre-retired life, from managing your finances to staying healthy in body, mind, and spirit, dealing with divorce, and even looking for love or work, the book covers the issues that really matter to you. Whether you’re looking for a retirement home or planning a cruise, this book is packed with specific details to help take the guesswork out of retirement. 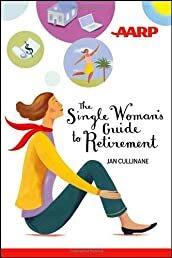 Author and retirement expert Jan Cullinane has gathered real-life stories from women just like you to illustrate your options and give you fresh new ideas about how to make the most of your retirement years.